Santos has begun a specialised irrigation program to further improve soil quality at a salt impacted legacy operational site. Over the coming days, the site will be irrigated for up to 10 hours a day to fully saturate the impacted area. The water, currently stored in two 60,000 litre tanks on Santos’ Bibblewindi site, has been sourced from Santos’ local water bores. Soluble gypsum and granular sulphur will be added to the soil to reduce the PH level. This program has been developed in consultation with expert environmental consultants. We have also worked closely with relevant government regulatory bodies and will continue to do so. 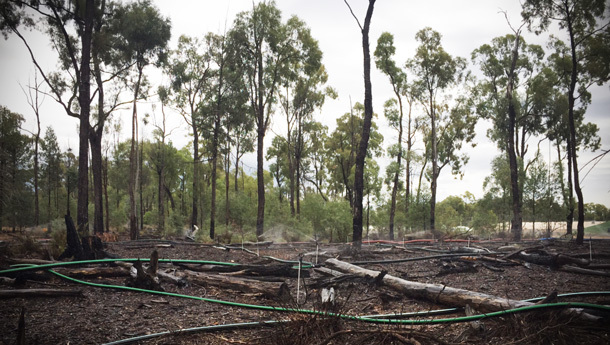 The work is necessary to improve the soil that was impacted by a spill of salty water, which affected about 1.5ha of land, prior to Santos acquiring the Narrabri operations. Since taking over operations near Narrabri we have undertaken extensive rehabilitation in that area and have spent in excess of $17 million as part of the rehabilitation program of our legacy operational areas since 2012. Monitoring has shown that through our work, there have been significant improvements in the soil quality. Santos will continue this treatment until soil targets are met. We will then commence the assisted revegetation.